While doing floor coverage with starlightzone in the Exhibit Hall, we had to pleasure of meeting Mario, who was also running a very aggressive campaign with his own entourage (Princess and Toad). Mario explains that he’s running for president in 2012 and admits to selling out completely for any and everybody’s vote. 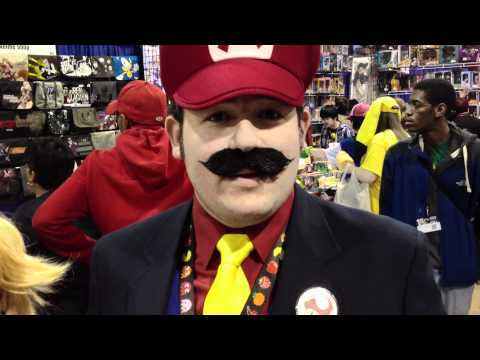 We gave Mario one of our exclusive Animeism.org bags and received an awesome Mario4Prez2012 Button that I proudly wore the entire convention. Mario for Prez 2012!! We have really enjoyed meeting you all this weekend! First and foremost, I apologize to all of the people who I caused to explode into quarters. I’m still not really sure why that happens yet. - Clearly, the rave. Hopefully tonight’s is as entertaining! - Every girl dressed like Pikachu. I love all of you, individually, with all of my heart. - All the people who seemed genuinely happy to get an animeism bag from us. Thank you! We hope you enjoy them! - Getting turned down for cosplay speed dating. Although I did my own version of speed dating by going around asking cute girls if they knew where I could find the speed dating. - Every guy dressed like Pikachu. Not that guys cant dress up like pikachu, but you got my hopes up for a second, damn it. - The guy who pulled the fire alarm. wtf bro. Again, if you want to be in the anime we are creating, Zodiac, please go fill out a profile on our website! – It’s fast, fun and 100% free! We have tons of characters still in development, both filler and main, and we want your help creating them! Anime for the people, by the people. If we took your photo earlier it will be on the site shortly! Check back to see them! We’re going to the rave now – we suggest you do the same. If you see us come say hi! If you’re reading this then you were most likely harassed.. physically.. by a member of our team. so congratulations on that! We are here, as I’m sure you all are, to dominate ACEN with the power of a thousand suns. We are a group of 10 hot/fun/interesting/ALT guys here to bring you extensive, intimate, consensual con coverage. You can recognize us by our immaculate smiles, piercing eyes, perfect bodies, outstanding social skills, and “ask me how to be in my anime” t-shirts. I’ll be the one cosplaying as Justin Bieber cosplaying Scott Pilgrim. Only one of us has died so far, so we’re feeling pretty confident about the rest of the weekend. Check back for more updates. Good luck out there amongst the crazy people.